A fast-growing vine, Virginia creeper ascends up to 50 feet in sun or partial shade. It clings to trees, fences and walls with adhesive-tipped tendrils and turns a showy red in fall. Its green, serrated, five-leafed foliage is 4 to 8 inches across. Virginia creeper develops clusters of waxy bluish-black berries that are attractive to birds and the plant is tolerant of salt and poor soils. Grow Virginia creeper in USDA zones 3 through 9 in full sun to partial shade. Virginia creeper grows wild in deciduous forests and is often mistaken for poison ivy. Look for its signature five-leaved foliage to differentiate it from its toxic neighbor. Take tender tip cuttings of at least two leaf nodes. Insert cuttings ½ inch deep into potting soil, sand or perlite. Keep evenly moist for two weeks. To determine if plants have developed roots, gently tug on the plantlet. If you encounter resistance, it has roots and is ready to transplant. Transplant Virginia creeper in early spring or late summer. Choose your location and dig a hole large enough to accommodate your newly rooted plant. Your plant should sit in the hole deep enough to cover the roots and approximately 1 inch of the stem. Cover roots with soil and tamp the soil down to eliminate air pockets. Keep your newly planted cuttings moist until established. To encourage the vines to grow in the direction of your desired support, install a small nail or hook into the fence, stump or wall. Tie the vine to the support and allow its tendrils to establish on the surface. You can remove the support once the plant is clinging naturally. 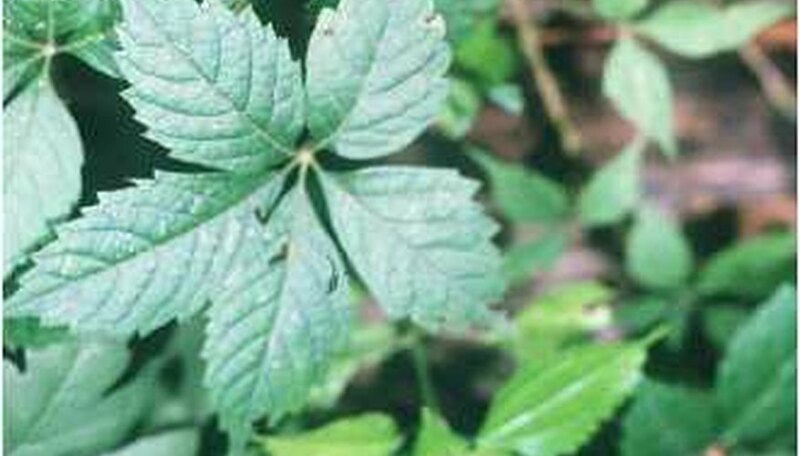 Use Virginia creeper in areas where road salts or sea spray prevent the use of other, more delicate climbers. Virginia creeper can grow out of control. It can kill existing trees and damage siding if left unpruned. If vines are becoming problematic, cut them at the base and paint the stump with an approved herbicide.